The Wisconsin Academic Advising Awards are intended to recognize individuals who work with, for, and in favor of students in an academic advising capacity, and those who have demonstrated outstanding dedication to the profession of academic advising. These awards are available to all individuals in any institution of higher education in the State of Wisconsin. For all awards, except the Peer Advisor and Graduate Student Scholarship, the nominator needs only to complete the “Nomination Form,” and send to the Awards Chair (Past president of WACADA). For Peer Advisor and Grad Student Scholarship details, see below. The Awards Committee will review all the information and make the selections prior to the Annual WACADA conference. 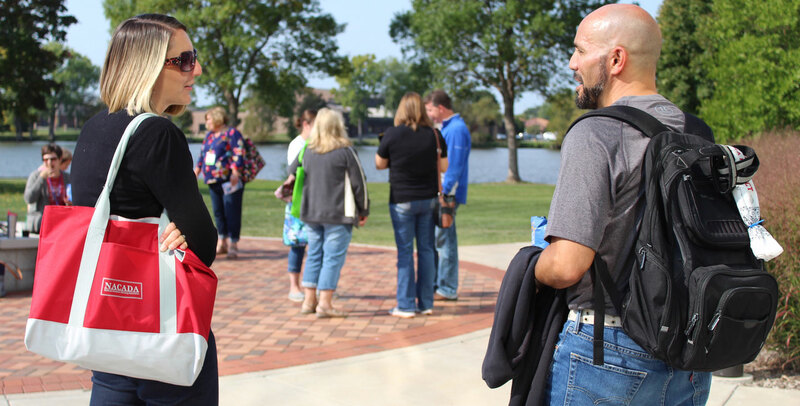 Awards will be presented at the 2019 WACADA Fall Annual Conference, on September 12-13th at Milwaukee Area Technical College (MATC). For more information please contact Blake Bishop at blake.bishop@uwex.edu. Designed to recognize faculty or full-time advisors who have five or fewer years of experience in advising (at any institution) and have made significant impact in their unit, on campus, or in the field of advising. • Appropriate referral to information on careers, curricula, scheduling, college success, etc. This award recognizes an advising office staff member whose hard work and dedication positively influences the students’ perceptions of the unit and/or the overall functioning of the unit. Nominees should have demonstrated commitment to overall office operations. Offices that serve students day-in and day-out depend on competent, professional and committed individuals that make it possible for advisors to do their work. Nominee’s may either be the first person a student meets in offices, or the person who works “behind the scenes” in the successful administration of an advising program or unit. In the spirit of WACADA’s founding members, the Leadership Award intends to recognize individuals strong in leadership skills. Nominees must be a member and demonstrated leader of the WACADA organization as well as in the field of academic advising. To recognize outstanding achievement and longevity in advising. Nominees must have a minimum of 10 years in the advising profession (at any institution). They should show a record of excellence in their own areas, as well as distinctive contributions to the university or college as a whole (for example, committee work or volunteer work beyond the scope of their offices) and/or distinguished achievement in developing new, creative and effective programs for meeting student needs. Demonstrate comprehensive knowledge of coursework and applies this knowledge to practice; take a leadership role and demonstrate a commitment to the advancement of the advising profession; foster student development (cognitive, career, identity, personal) through advising and strive to create effective advising partnerships with students. This award will allow current students in advising or related fields to join WACADA. We’ll provide a one year membership and pay registration for the recipient(s) to attend the WACADA annual conference. Award winners will be announced and funds disbursed at the WACADA fall conference. Applicants must be enrolled in a graduate school program focusing on academic advising or related field; must be a full or part time graduate student who is not working full time; must use Professional Development Grant for WACADA membership and conference. Process: Applicants must submit a brief statement regarding your current field of study and why you feel you should receive a professional development grant and a letter of recommendation from current advisor or faculty. This award was created to recognize student peers who contribute in instrumental ways to many advising offices. Selection will be based on a variety of criteria to include evidence of effective qualities and practices that distinguish the nominee as an outstanding peer advisor. Process: Nominators must submit a letter outlining the evidence that supports the nomination. Nominators are encouraged to address the ways in which the peers contribute, their unique strengths and ideas, other ways the peer is involved on campus, current year in college and future aspirations. Congratulations to the 2018 WACADA Award Winners!